Please welcome two talented groups from Albany High School makeing their Freight debut. The much lauded Albany High School Jazz Band features a program of Duke Ellington, Wayne Shorter, Pat Metheny, Mary Lou Williams, and Oliver Neslon. 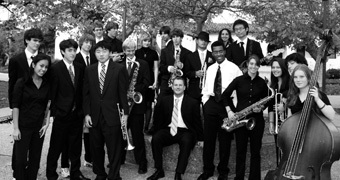 Under the direction of Craig Bryant, this top performance ensemble from the Albany High School has received unanimous superior ratings at the CMEA Jazz Festival annually and wiining awards at the Reno and Santa Cruz Jazz Festivals, and recording at the Lincoln Center's Esentially Ellington contest. Albany High School's "Rhythm Bound" has been delighting audiences for well over tha decade with the sound of Staxx, Motown, and other classic R&B artists. Directed by Tim Hyland, theis group always gets the party going.